Cesar Bresgen. "Bilder des Todes". Suite for two pianos and percussion after Hans Holbein's "Dances of Death". Sandor Veress. Hommage a Paul Klee. Fantasie for two pianos and strings. Bela Bartok. Sonate for two pianos and percussions. 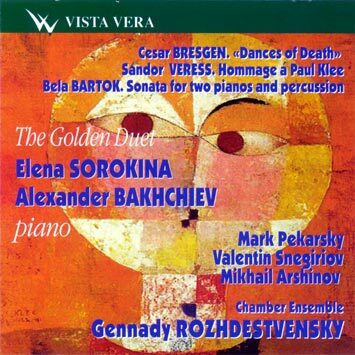 The idea to make recordings of unknown works by Cesar Bresgen and Sandor Veress was first put forward by Gennady Rozhdestvensky. What their compositions have in common is that it was works by artists that gave impetus to the composers to write them. The famous Dances of Death wood engravings by Hans Holbein the Younger (1494 - 1534) became source of inspiration for more than one composer. Perhaps two most significant works in music directly inspired by Holbein were Arthur Honneger's cantata Dances of Death (1938) and an Austrian composer Cesar Bresgen composition for two piano and percussions with similar title, Dances of Death (1966). The music of Dances of Death was used as the basis for the ballet performance in Weimar that was accompanied by showing slides with Holbein's engravings. A medieval German song O cruel death! is cited in the composition. The composer, as Gennady Rozhdestvensky put it, tried to reflect not only Holbein's images but also a rhythmical structure of his engravings. Sandor Veress, a productive composer and Bartok's student at Budapest Academy of Music also did not escape the influence of his tutor. Veress' Fantasia for two pianos and string orchestra, Hommage a Paul Klee (1951), represents an attempt to create a sound equivalent to the picture by the Swiss artist who was also a poet and musician. Paul Klee (1979 - 1940) worked at one time as a violinist with the Berne Symphony orchestra. He also was a student of folklore, his diaries full of score records of folk songs. It would be fair to say that Paul Klee was one of the most "musical" artists. Even the titles of many of his works speak for themselves: Arab Song. The Order of High C. Fragment from a Ballet for Aeolian Harp, etc. The Sonata was one of Bartok's favourite compositions. As he wrote in the Swiss paper National Zeitung, For many years I have been planning to write a piece for piano and percussion. But while by while I was coming to the conclusion that one piano does not give an adequate balance with the whole group of percussions. So I changed my intentions in a sense that instead of one I employed two pianos to counter percussion. The score of the Sonata is premised with a page where the author drew a plan of placing the musicians on the stage. The group of percussion, that is two musicians with twelve instruments, is to occupy place in the center and at the back of the stage while the grand pianos are put at the forefront and on both sides of the stage. This creates a natural stereophonic effect. Both two pianos and percussion display new expressive means in the piece.